The 12U Mt. Laurel STORM Softball team recently won the Eastern National Softball Championship. Coach Jeffrey Cofsky said no words could appropriately describe all the events that transpired leading up to even qualifying for the Eastern Nationals. According to Cofsky, in what he could only describe as a truly unforgettable storybook-like experience, The 12U Girls Mt. 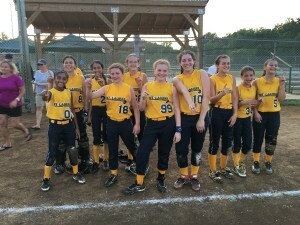 Laurel STORM Softball Team qualified for and won the Eastern National Championships. The tournament, held in Sterling, Va., attracted the brackets 18 best teams from up and down the east coast. Mt. Laurel, who was 15th out of 18 in the pre-tournament rankings, opened the tournament winning four of its first five to make it to the semi-finals. The girls ended up having to play four games on that final day with temperatures soaring over 105 degrees. After losing their first game on that final Sunday, the girls came back and won the next three games, all of which were thrilling victories. In the Championship game, Mt. Laurel came out on top 10–0, beating a Stafford Stingray Team that just seemed to wilt in the extreme heat. Cofsky said he couldn’t be happier for the girls. “This amazing group of 10 girls was the hardest working team I have ever been privileged to coach. The entire experience could not have been scripted any better if it were in a movie”, Cofsky said. “Mt. Laurel Softball has long been known to be the “gold standard” for Recreational Softball Programs in the South Jersey area, consistently having the most players and best coaches, and highest talent level in the area. Now the Travel Program is catching up to our REC program” Cofsky said. In addition to winning the Championship, some Mt. Laurel girls won individual awards as well. Kayla Patel won Defensive Player of the Tournament for her outstanding defensive play throughout the entire tournament. Casey Cofsky took home the Offensive Player of the Tournament for consistently getting big timely hits including her team leading seventh home run of the season.